Perry is attending a bar association dinner when Daniel Conway approaches him to say he's just found his rival's secretary, dead. Conway is sure he is being framed for murder. He's involved in a vicious proxy war with Warner Griffith over Cal-Texas Exploration. Perry thinks he can solve this one in a jiffy, and tries to corral Griffith into a confession. He's surprised and puzzled to get an ironclad alibi instead. That doesn't stop Perry from finding a unique, if weird, witness who has a photographic memory and can identify people by their shoes. We see a very dapper Perry in this episode (check out his bow tie). Also, watch the sparks fly between Perry and Della during this case. CARS: 1958 Cadillac convertible, black, white top up (Mason). From The Cars by Greg Cockerill. We see Perry wearing a tuxedo in the first half of this show. Paul had worn a tuxedo earlier in TCOT Crooked Candle. Submitted by PaulDrake33, 5 June 2008. Old-time cowboy star Johnny Mack Brown has a prominent role here. This would be the only time after 1934 that he is to act in anything other than a western show. Submitted by PaulDrake33, 5 June 2008. There are several camera angles in the courtroom that normally do not appear in the other shows. One is from behind the judge�s right shoulder that shows a wide view of the jury. In most shows the camera angle is from the jury box. Submitted by PaulDrake33, 5 June 2008. There is a photograph of Rose Calvert on the mantle of her husband Fred Calvert�s home. The next day this same photograph would be on the front page of the Los Angeles Chronicle newspaper. Submitted by PaulDrake33, 21 October 2008. The picture above the fireplace in Mrs. Griffith�s apartment (you can see it when Mavis Jordan is looking at Griffith�s shoes) is Girl with a Watering Can by Pierre Auguste Renoir. See here. I think this painting appears in other episodes. The distinctively patterned �window� in Mrs. Griffith�s apartment is used in a number of Perry Mason episodes. Submitted by billp, 1/21/2009. Sightings: The elderly lady in the jury who skittishly handles the gun appears in many Perry Mason episodes, usually as a spectator. billp 1/21/2009. + We call her Little Old Lady in a Hat or simply Little Old Lady #1. Read more about her and other favorite frequent faces on the Who Is That? page and see a picture of her with the gun here. Submitted by gracep 8/23/2010, updated 11/21/2010. +Distinguished Gentelman #1 sits in court on Burger's side. Submitted by BigBill767, Nov 11, 2016. Location: The establishing shot for the �Hotel Redfern� is the Bryson Apartment Hotel. This same footage is also used in #33, TCOT Long-legged Models. Submitted by billp, 1/21/09. + The Bryson was also used in episodes #33 and #62. Submitted by Eric Cooper, 11 January 11. Sightings: At Empire Drug, Distinguished Gentleman #1 steps out of a phone booth as Conway heads for his. One of the jurors is Distinguished Lady #1, who also magically appears in the gallery during the elevator operator�s testimony. Little Old Lady #2 is also in the gallery throughout the trial. More about them here. Submitted by gracenote, 8/31/2011. + One of the jurors is played by Distinguished Lady #4. Submitted by gracenote, 9/6/2011. Uncredited Actors: At the last session of court, Don Anderson appears among the returning spectators on the defense side. As everyone rises for the judge, we can see former heavyweight boxer Tom Kennedy in the gallery as well. Submitted by gracenote, 8/31/2011. + This is one of my favorites mostly because of the elevator operator. :-) She's reading an Erle Stanley Gardner book under his pen name A. A. Fair, You Can Die Laughing. I loved that touch. posted by Lara Fabans on Perry Mason Yahoo Group, 11/3/18. The opening shot, presumably the building where Cal-Texas is, is also used in #32, TCOT Substitute Face as the locale of the bank where Carl Houser works. The dictating machine used by Daniel Conway is the Dictaphone Time Master also seen in Substitute Face and elsewhere. Submitted by billp, 1/21/2009. 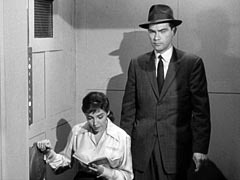 Given what Fred Calvert says about his separation, the action in this episode seems to take place in winter, shortly before 2/9. The episode was aired 3/29/1958. Submitted by billp, 1/21/2009. When talking about hotels for Conway, Della suggest ones on �Tracy Boulevard.� AFAIK, there is no such street in LA. Submitted by billp, 1/21/2009. Fred Calvert lives at 163 Vista Lane, Ellendale, California. AFAIK there is no Ellendale. In the show it looks to be about 51 miles from LA. Regardless, does anyone recognize the Fred Calvert house, as it�s on a real street? Submitted by billp, 1/21/2009. Mrs. Griffith tells Conway to go to �Empire Drug� at something and La Brea. The something sounds like Weldon to me, but there is no such street. Was there ever an �Empire Drug� in LA? Submitted by billp, 1/21/09. + There is a Weldon Ave. in L.A. near Glendale, but that is no where near La Brea. It sounds to me like Mrs. Griffith says Welton and La Brea. Could not find a Welton In L.A. Submitted by Craig, 2/27/2010. Burger tells Mason he�d have him �smelling brimstone through a nail hole.� This is possibly a bowdlerized version. I�ve never heard this expression before. Does anyone know the origin of this phrase? billp 1/21/09. + There is a use of the phrase �smelling brimstone ect.� in the book A Subaltern�s Furlough V1 written in 1833. Submitted by Craig, 2/27/2010. Perry does seem to be intrigued by the cheesecake photo of Rose Calvert. Maybe he does like girls. Submitted by 65tosspowertrap, 4-17-2014. + As Jon Lovitz would say, "Acting!" Submitted by francis, 6/12/14. Our Gal Friday: Perry returned to his office from Ellendale after 1:00 AM. Della was still there, with Paul and Mr. Griffith waiting in Perry's office. Della had prepared a gallon of coffee. When she handed a cup and saucer to Perry she asked, "Who's going to do your dishes?" Perry's glib response: "You will, tomorrow. Have a good night." Hmmm. Is Della hourly or salaried? lowercase masonite, 1/15/16. A Late News Flash from the Los Angeles Chronicle: Below the banner headline SECRETARY SLAIN IN HOTEL ROOM is a photo of Rose Calvert, not clad only in a flimsy negligee (at 18:40 on the 2006 Paramount DVD). Next to her photo is an article headlined MERCURY NEW X-RAY SOURCE, TWO SCIENTISTS REPORT, the two scientists being Wesley M. Coates and David H. Sloan. Dr. Coates did publish an article about this -- in 1934. See for example http://journals.aps.org/pr/abstract/10.1103/PhysRev.46.542. He died in 1937, electrocuted in x-ray laboratory at medical center, http://spectatorarchive.library.columbia.edu/cgi-bin/columbia?a=d&d=cs19370322-01.2.2. lowercase masonite, 1/15/16. + This story is also reported on the front page of the Los Angeles Star-News in the next episode, TCOT Hesitant Hostess. Submitted by Kilo 5/30/2017 + It turns out this same article appears in newspapers in many future PMs. Submitted by Kilo 6/27/2017. Fred Calvert (played by Jack Weston) was convicted based on a possible identification of the shoes he wore. In real life, Jack Weston was born the son of a shoe repairman. Submitted by Charles Richmond, 10/20/2008.